A few weeks ago I talked about teaching your kids to love learning. This weekend I actually noticed it happening. We had a few nice days in a row, which was amazing after a week straight of rain and cold! So of course I was outside in the garden. We also brought the chicks outside for their first experience outdoors as well. 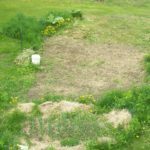 I wanted to get some more seeds in the ground – something I am constantly thinking about. Of course, my kids wanted to help me. Emma especially has shown a natural gravity towards our chicks and also the garden. Every time we are outside, she wants to plant something, she wants to dig up something, or turn the compost pile. I know that most kids love being outside, but I think that because I am so passionate about food and the garden, she is becoming the same way as well. She also has a natural affinity to the chicks. I know that chicks are extremely cute and cuddly looking, but I wasn’t sure how my almost 4 year old would do with them. Would they scare her as they got a bit larger, would she squeeze them too hard by accident. Nope, none of the above. In fact, when we all went outside, the chicks just followed the kids around the yard, wherever the kids were, the chicks would follow. It was incredibly cute. When planting the seeds I would explain how to put one seed down at a time, or to scatter them, and she would listen. Jack…well he just likes to throw the seeds…and then the dirt, but that’s ok 🙂 They were so interested in what I was doing, and wanted to follow my lead. It was incredibly encouraging to see my passions showing up in their lives. 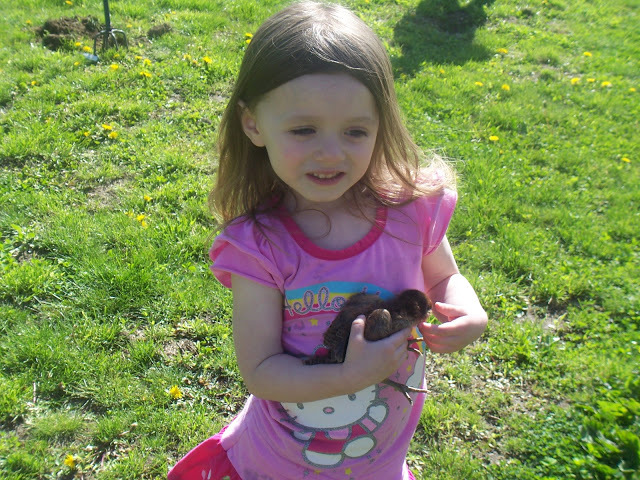 Now, I know that gardening and raising chickens isn’t for everyone, but we are learning quite a lot right now, and I love to see that light in my babes’ eyes and the connection that they are making to the outdoors. I think this homeschooling/unschooling/reading/playing outside thing that we are attempting to do, well, it is working. I want my kids to have passion in their lives, and if they see us living what we love, I think that will happen naturally. Are you living what you love? How do your kids respond to it? I am linking up at the Hip Homeschool Hop! Is it possible to eat a local & seasonal plant based diet? I've enjoyed each season in my life, and especially this current one as mama. Glad to have found this link-up! We're homeschooling next year due to a relocation and leaving a classical, Christian school that we adore. I'm excited to homeschool again though, too. Cute kiddo and chick! Definitely living what I love — wish I had been able to do it sooner in life, but that's just hindsight. Every day is a joy. I am living what I love for the most part. 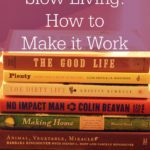 I'm devoting much of my time to my kids what with homeschooling and all, I'm finding time to run, time to blog, time to write, time for my friends, and time for my husband. And all of that, it turns out is "me" time because I love it. I found you on the Hip Homeschool Hop. Come see us at Layers of Learning. While I do live what I love most of the time, I am kind of in the process of defining exactly what it is that I "LOVE" at this stage of life. While I would love to have a farm and sheep, I am now getting closer to my 50's and don't have nearly enough energy for that! I have enjoyed gardening with my daughter lately and am thrilled that at 16 that she has an interest. It's pretty neat! I agree completely! I know that the girls have a love of animals, nature and being outside because it's something we do constantly and have since they were wee ones. Reading is another huge one – although I don't always have a novel in front of me, I'm always reading something – and I think kids are a direct reflection of that. Now if they could just develop a love of cleaning…. My children for the most part love this life style, but like most teenagers they would rather not spent an afternoon pulling weeds or cleaning out coops. On the other hand, they do love the wide open spaces and the food we eat!